Advising clients on all aspects of bankruptcy, corporate reorganization, workout, and creditors’ rights matters. Calfee’s Bankruptcy and Creditors’ Rights Litigation practice incorporates all aspects of bankruptcy, corporate reorganization, workout, and creditors’ rights matters. Our litigation attorneys have worked with clients involved in adversary proceedings and appeals, claims litigation and appeals, dischargeability litigation, preference and fraudulent transfer litigation, as well as lien determination and priority proceedings. Our attorneys also have experience in commercial foreclosure and receivership litigation proceedings. Representative projects include obtaining relief from an automatic stay to enforcing claims against secured collateral, proceedings for dismissing bankruptcy petitions filed in bad faith, determining validity and priority of conflicting lien claims, reviewing substantial alleged preferential payments, equitable subordination, determining nondischargeability of claims and obtaining the appointment of a receiver in commercial litigation and foreclosure proceedings. 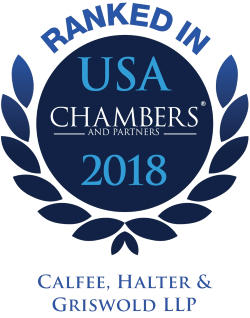 Calfee was selected for inclusion in the 2019 "Best Law Firms" rankings by U.S. News –Best Lawyers in America in Bankruptcy Litigation (Metropolitan Tier 3 Cleveland) and Bankruptcy and Creditor Debtor Rights / Insolvency and Reorganization Law (National Tier 3 and Metropolitan Tier 2 Cleveland). Represented financial institutions in proceedings to obtain relief from the automatic stay to enforce claims against secured collateral. Represented financial institutions and others in proceedings for dismissal of bankruptcy petitions filed in bad faith. Represented major international corporations in proceedings for allowance of claims in bankruptcy. Represented creditors and debtors in proceedings to determine dischargeability of debts and effect of discharge. Represented creditors in claims proceedings against an estate concerning environmental problems with property purchased from the debtor. Represented secured creditors in proceedings to determine validity and priority of conflicting lien claims. Represented creditors in cases dealing with post-confirmation claims. Represented creditors in proceedings to recover substantial alleged preferential payments and fraudulent transfers. Represented secured lender in foreclosure of commercial properties and obtained appointment of a receiver. Represented companies in collection of outstanding receivables.